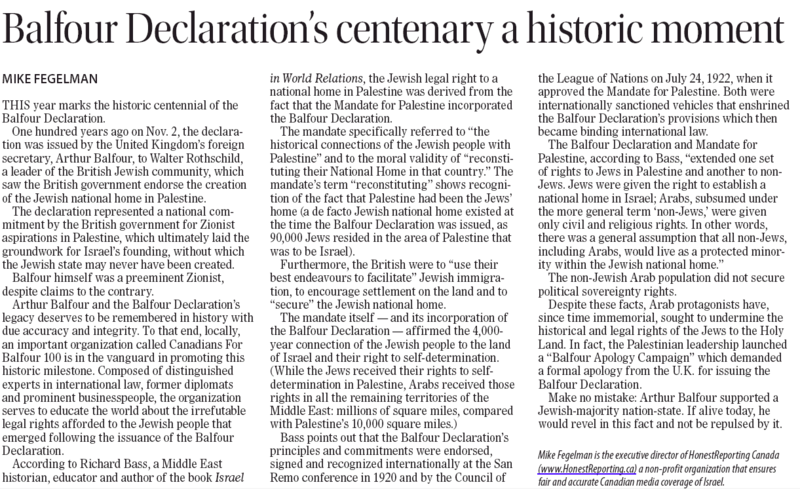 Today, the Winnipeg Free Press published a commentary authored by HonestReporting Canada Executive Director Mike Fegelman on the historic centennial of the Balfour Declaration. Our commentary published in the Free Press which has a readership reach of close to 500,000, further serves to crystallize the importance of the Balfour Declaration while affirming the Jewish legal rights to Israel. An unabridged version of our commentary can be found immediately below. To view the commentary on the Winnipeg Free Press website click here (an exclusive online subscription is required). 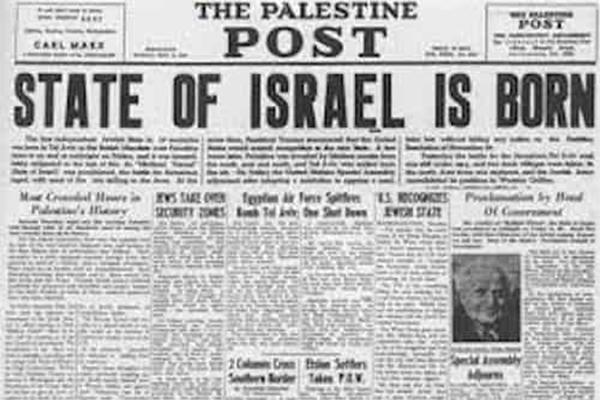 This year marks the historic centennial of the Balfour Declaration. 100 years ago on November 2, the Declaration was issued by the UK’s Foreign Secretary, Arthur Balfour, to Walter Rothschild, a leader of the British Jewish community, which saw the British government endorse the creation of the Jewish national home in Palestine. The Declaration represented a national commitment by the British government for Zionist aspirations in Palestine, which ultimately laid the groundwork for Israel’s founding, without which, the Jewish state may never have been created. Arthur Balfour and the Balfour Declaration’s legacy deserves to be remembered in history with due accuracy and integrity. To that end, locally, an important organization called Canadians For Balfour 100 (http://www.canadiansforbalfour100.org) is on the vanguard in promoting this historic milestone. Composed of distinguished experts in international law, former diplomats and prominent businesspeople, the organization serves to educate the world about the irrefutable legal rights afforded to the Jewish people that emerged following the issuance of the Balfour Declaration. Bass points out that the Balfour Declaration’s principles and commitments were endorsed, signed and recognized internationally at the San Remo conference in 1920 and by the Council of the League of Nations on July 24, 1922 when it approved the Mandate for Palestine. Both were internationally sanctioned vehicles that enshrined the Balfour Declaration’s provisions which then became binding international law. The Balfour Declaration and Mandate for Palestine, according to Bass, “… extended one set of rights to Jews in Palestine, and another to non-Jews. Jews were given the right to establish a national home in Israel; Arabs, subsumed under the more general term ‘non-Jews,’ were given only civil and religious rights. In other words, there was a general assumption that all non-Jews, including Arabs, would live as a protected minority within the Jewish national home.” The non-Jewish Arab population did not secure political sovereignty rights. Despite these facts, Arab protagonists have, since time immemorial, sought to undermine the historical and legal rights of the Jews to the Holy Land. In fact, the Palestinian leadership launched a “Balfour Apology Campaign” which demanded a formal apology from the UK for issuing the Balfour Declaration. We live in a world where fake news and alternative facts regrettably, is becoming the new norm and where Time Magazine is left asking “Is Truth Dead?”. The journalistic maxim that a news organization lives and dies by the strength of its sources is more important today than it ever was. Make no mistake, Arthur Balfour supported a Jewish-majority nation state. If alive today, he would revel in this fact and not be repulsed by it. Mike Fegelman is the Executive Director of HonestReporting Canada, a non-profit organization that ensures fair and accurate Canadian media coverage of Israel.